I’ll never forget the first time I saw my son’s face as he heard the news that one of his very few “best friends” had made some really bad choices and bowed to peer pressure. This friend came from a Christian family. He went to youth group. He was not even a teenager yet. My son was devastated. He knew that a lot of kids were experimenting, and getting into trouble, and we hadtalked about these kind of things. But one of his only “real friends?” If this one went down so early, what hope was there for keeping friends in the years to come? Would anyone stand strong through these years of temptation and peer pressure? I wanted to encourage my son, yet I had no words. None. I turned him to my husband, who could share a similar story of watching his childhood friends slip away, one.by.one. He stood strong, and committed himself to sports, to art, and to playing guitar. Eventually, many years later, he made good friends, who shared his faith and his convictions. But the years in between were lonely. Talking with his dad helped a bit, but as an extrovert, the loneliness would affect my son differently than it affected his introverted father. 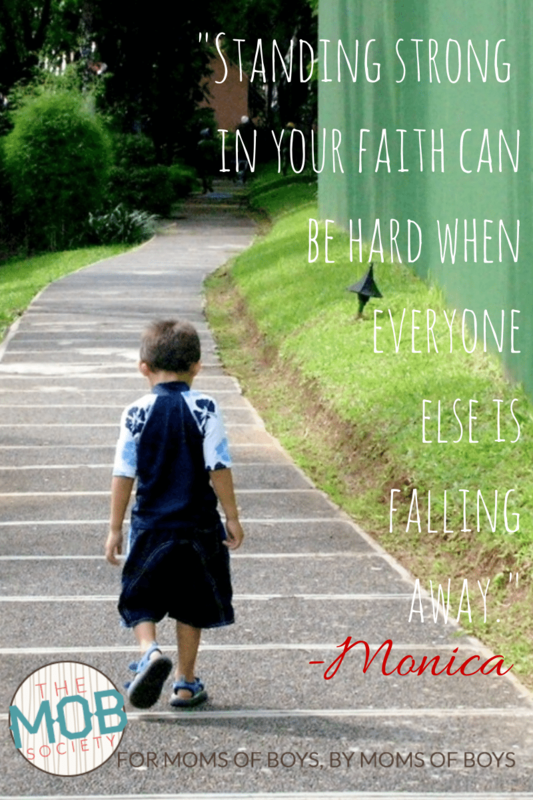 Standing strong in faith can be really hard when everyone around you is falling away. It is good to prepare our boys well, so that when they face that day they are better equipped to weather the loneliness. Here are a few things we have focused on when talking to our boys about standing strong, when they feel like they’re alone in their convictions. 1. What you are going through is very normal. MANY Christian boys/teens have walked the lonely road of following God’s ways when it seemed the rest of the world did not. 2. Pay Day, Someday. The benefits of your choices are going to pay off, big time. Not only will you avoid many problems and heartaches, but you will be blessed by knowing that you are pleasing the Lord. 3. Let the Lord become your very best friend. This is a time that you can grow very close to the Lord, and that relationship will be with you for the rest of your life. 4. Pray for friends to whom you can really relate, and seek out positive, safe places to meet them. 5. Pray for the friends who have fallen away and seek opportunities to share with them. Don’t give up–they may find out quickly that they have made bad choices, and be ready to give them grace and grow again in friendship. 6. Find older role models. Seek out an older role model for your son. This allows them to empathize as well as draw inspiration and encouragement from a mentoring relationship. Psalm 1 is a great Scripture on this topic. I suggest reading it and helping your kids to memorize the whole chapter. Dear Lord, thank you for your love and grace that covers our families. Please guide and protect our sons as they try to stand firm in a world that throws temptations at them constantly. I pray that you would provide friends, role models, and a most of all a deep relationship with you that will help them overcome all temptations. Then use them to be a light to the kids around them that have lost their way!